Withdrawal estimates for each category represent the total amount of water removed from the water source, regardless of how much of that total is consumptively used. In most cases, some fraction of the total withdrawal will be returned to the same or a different water source after use and is available for other withdrawals. In 2010, Californians withdrew an estimated total of 38 billion gallons of water per day, compared with 46 billion gallons per day in 2005. Industrial water use includes water used for such purposes as fabricating, processing, washing, diluting, cooling, or transporting a product; incorporating water into a product; or for sanitation needs within the manufacturing facility. Some industries that use large amounts of water produce such commodities as food, paper, chemicals, refined petroleum, or primary metals. 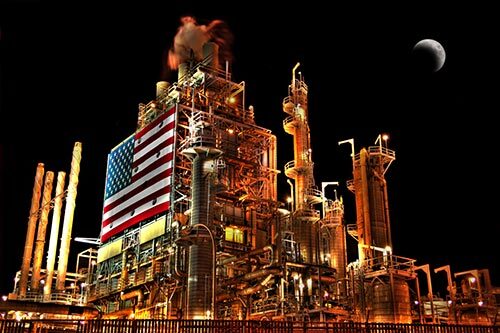 Oil refinery along the 405 Freeway in Torrance, California. Photo Credit: Chris Fore, Los Angeles, CA. Water for thermoelectric power is used in generating electricity with steam-driven turbine generators. One by-product of thermoelectric facilities is heat from the power-production equipment. The majority of the water used in thermoelectric power generation is for cooling the equipment, thus plants are often located alongside rivers and other water bodies. Moss Landing Power Plant, Moss Landing, California. Photo Credit: David Monniaux, Copyright © 2007. Domestic water use is for indoor household purposes such as drinking, food preparation, bathing, washing clothes and dishes, flushing toilets, and outdoor purposes such as watering lawns and gardens. Domestic water use includes potable and non-potable water provided to households by a public water supplier (domestic deliveries) and self-supplied from wells or other private sources. 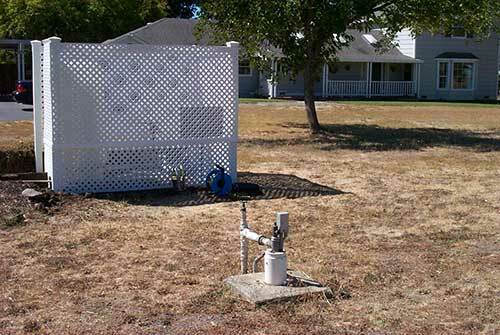 Domestic groundwater well in Napa Valley, CA. Livestock withdrawals include water for livestock watering, feedlots, dairy operations, and other on-farm needs. Types of livestock include dairy cows and heifers, beef cattle and calves, sheep and lambs, goats, hogs and pigs, horses and poultry. 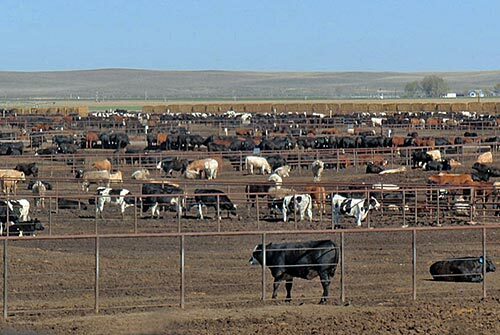 Cows on a feedlot in California's Central Valley. Public supply refers to water withdrawn by public and private water suppliers that provide water to at least 25 people or have a minimum of 15 connections. Public-supply water is delivered to users for domestic, commercial, and industrial purposes, and also is used for public services, such as pools, parks, and firefighting. City of Stockton, CA municipal water well. Aquaculture water use is associated with raising organisms that live in water—such as finfish and shellfish—for food, restoration, conservation, or sport. Aquaculture production occurs under controlled feeding, sanitation, and harvesting procedures primarily in ponds, flow-through raceways, and, to a lesser extent, cages, net pens, and tanks. Aquaculture ponds, raceways, and tanks usually require the withdrawal or diversion of water from a ground or surface source. 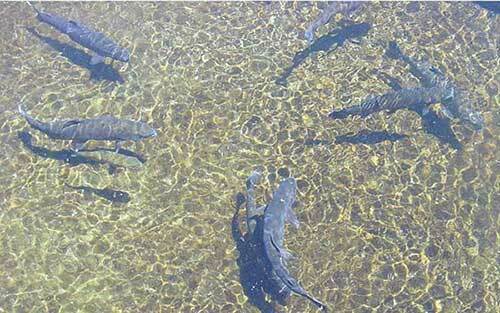 Most water withdrawn or diverted for aquaculture production is used to maintain pond levels and/or water quality. 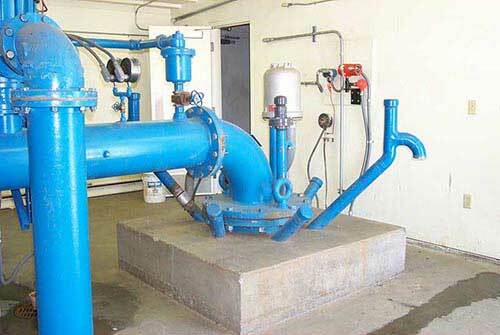 Water typically is added for maintenance of levels, oxygenation, temperature control, and flushing of wastes. Trout at a the Hot Creek Fish Hatchery near Mammoth, CA. Irrigation includes water applied by an irrigation system to assist crop and pasture growth, or to maintain vegetation on recreational lands such as parks and golf courses. 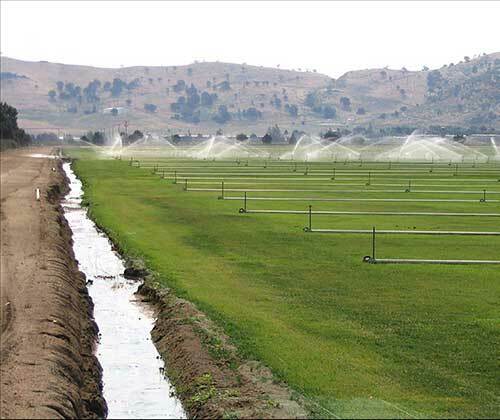 Irrigation includes water that is applied for pre-irrigation, frost protection, chemical application, weed control, field preparation, crop cooling, harvesting, dust suppression, leaching of salts from the root zone, and conveyance losses. Crops being irrigated in California's Central Valley. 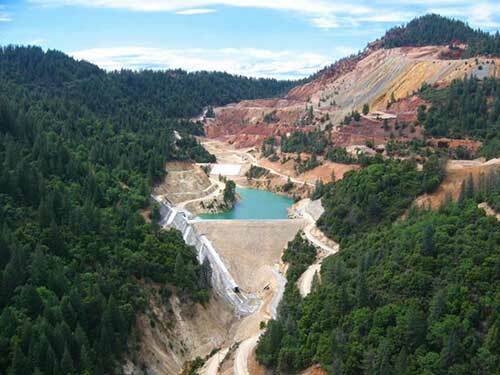 Mining water use is water used for the extraction of naturally occurring minerals including solids (such as coal, sand, gravel, and other ores), liquids (such as crude petroleum), and gases (such as natural gas). Also includes uses associated with quarrying, milling, and other preparations customarily done at the mine site or as part of a mining activity. Does not include water associated with dewatering of the aquifer that is not put to beneficial use. Also does not include water used in processing, such as smelting, refining petroleum, or slurry pipeline operations. These processing uses are included in industrial water use. Spring Creek Reservoir near the Iron Mountain mining site just north of Redding, CA. Hover over the graph for more detailed numbers. Click the legend to toggle columns on and off.